Calidad Home Silk Pillowcase - Why do you need a silk pillowcase? Over the last year or so, I’ve seen so much buzz around silk pillowcases and the positives for using one. I’ve only ever had cotton pillowcases so I wasn’t sure if I’d like a silk pillowcase, but when I was offered the Calidad Home Silk Pillowcase, I thought it was the perfect opportunity to give it a whirl. Silk is an experience material, so a silk pillowcase is always going to be a pricey investment but I was really interested to see how it’d compare to an ordinary pillowcase. 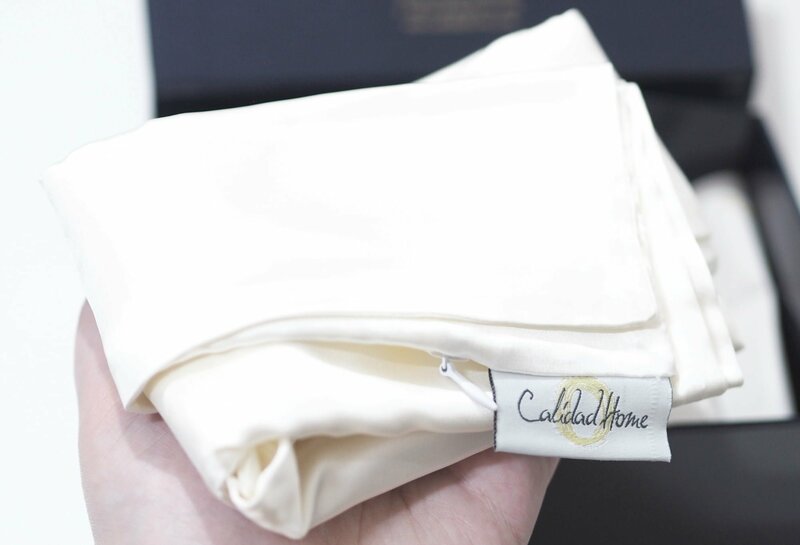 Calidad Home offer their luxury pillowcase boxed or unboxed, and I have the beautiful boxed Calidad Home Silk Pillowcase to show you today. The Calidad Home Silk Pillowcase £63.99 is available in three different colours; Ivory, Taupe and White and I have the Ivory option. The pillowcase is 50cm x 75cm and will fit most UK standard pillows, and it’s fit mine absolutely perfectly. 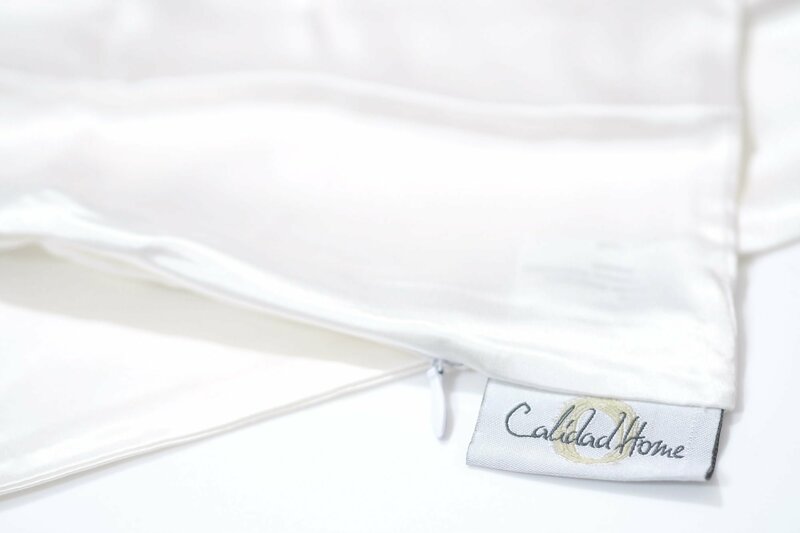 Calidad Home offer a fantastic 30 day money back guarantee where you can send the pillowcase back if for any reason you don’t love it, which emphasises how confident they are with their product. They also offer free next day deliveries on orders placed before 1pm, except weekends and bank holidays so you don’t have to wait ages for your delivery to arrive. The pillowcase features luxury 100% genuine 22 momme Mulberry silk. Momme is used to measure the density and quality of the silk, and the average momme weight for silk is 12-22 momme, making the Calidad Home Silk Pillowcase a super luxurious, high quality pillowcase as the higher the weight in mommes, the more durable the weave is. Silk has a natural resistance to dust mites, fungus and mould, in addition to other allergens. Silk pillowcases have been recommended by dermatologists as an anti-aging tool keeping it soft, supple and helping reduce fine lines and wrinkles. Silk can help the skin to retain its moisture, by keeping the moisture close to the skin to prevent the skin from becoming dehydrated. Cotton, by contrast, is a very absorbent fabric which draws moisture from your face and hair. Tests have shown that silk is made of strings of amino acids that have the same ph level as our skin making it naturally hypoallergenic. Natural mulberry silk containing sericin, which is a protein that reduces the possibility of an allergic reaction making it beneficial for those who suffer from sensitive skin and conditions, such as rosacea and eczema. Sleeping on a silk pillowcase has been proven to reduce friction on your hair, which can cause damage. It’ll help to keep your hair smooth, and help reduce possible frizziness. By using silk, there’s a lot less friction and no creasing of our skin whilst we sleep, and silk doesn’t absorb the scalp’s natural oils meaning the scalp won’t then overproduce oils to compensate for the loss of oils. 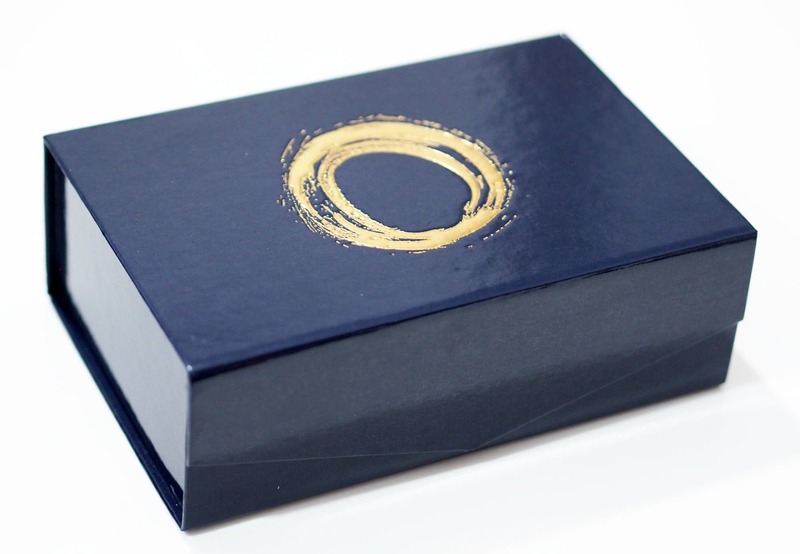 The gift boxed version of the Calidad Home Silk Pillowcase comes wrapped in branded tissue paper within a shiny, navy gift box. I was pleasantly surprise that the pillowcase had a zipper as I’ve never had a zip on a pillowcase before but I don’t know why more brands don’t use zippers on their pillowcases as it totally makes sense and keeps your pillow in place. I’ve only ever slept on cotton pillowcases, and I always assumed that they were soft, but since trying the Calidad Home Silk Pillowcase, it’s crazy how stiff and scratchy a cotton pillowcase now feels for me. As we age, our skin stops producing collagen and loses elasticity, and when we put our head on our pillowcases, creases can form from the pressure and friction with our skin against the fabric. 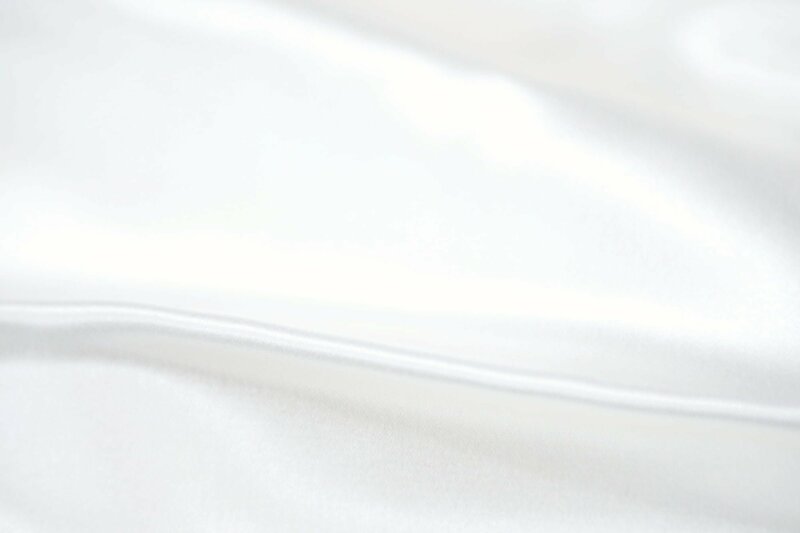 The silk pillowcase is a worthy investment in terms of comfort and for our hair, and skin and I know I’m going to appreciate the beautiful silk once the temperatures begin to heat up again as silk naturally regulates heat, and doesn’t conduct heat so it’ll be a godsend for keeping cool. FYI: If you were tempted in trying this lovely pillowcase, it’s currently got 40% off on their website so it’s the perfect time to treat yourself. Have you ever tried a silk pillowcase before?